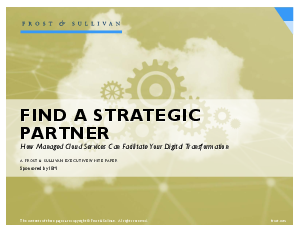 In 2017, Frost & Sullivan interviewed nearly 270 CIOs and senior executives who were directly involved in purchasing Managed Cloud Services. Those executives shared their views on how the right managed services provider must have the expertise and skills to do more than just manage the infrastructure. This interactive whitepaper illustrates why 76% of CIOs considered cloud managed services an essential part of their IT strategy.